An escape room is a live-action adventure game in which two or more players are locked in a themed room and have to use elements within the room to find clues, solve puzzles and escape the room within 60 minutes. The games were created in Japan using physical versions of the popular “escape the room” video game. Our games are set in a variety of fictional locations like a biochemical lab and a mob boss office. Our dedicated staff can arrange all the details for your group event of six or more down to food and drinks in our comfortable lounge area! Private events require the full purchase of one or more rooms. We welcome private parties outside of our regular hours. Just call 301-360-5971 to reserve your next event. 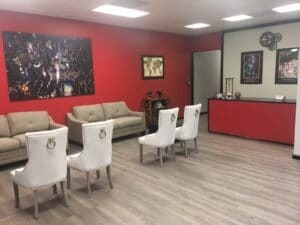 Escaping one of our challenging rooms requires all the elements of a good team: leadership, observation, problem-solving, logic and proper communication are all essential in order to escape the room in under 60 minutes. It is the perfect activity for corporate groups to come together for one unique and engaging purpose, to build up your team’s ability to work together and be entertained in the process! Looking for the best venue to host your next birthday party, bridal shower, bachelor party, holiday party or team-building event? 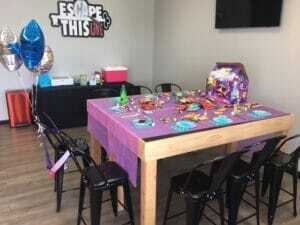 Escape from the ordinary here at “Escape This” and enjoy a great event in our comfortable lounge with free WiFi. 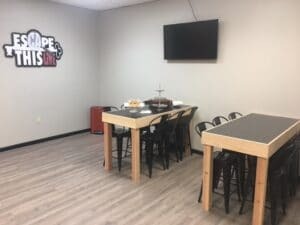 Whether you’re looking for a new adventure with your family, or you’re just looking for something new to start off your evening with your friends, let “Escape This” get you out of your comfort zone with our fun and challenging escape rooms. We guarantee you will have something to talk about for a long time! Make sure you visit our comfortable lounge with free WiFi, take your group pictures and enjoy great refreshments. Want to impress your date with a unique outing? Invite them to “Escape This”! Pick one of our challenging rooms and let the fun begin! You might even be able to save the world from sure danger and be a hero to your date. Everyone loves a hero!